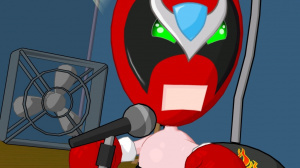 We expect that the third Strong Bad outing is likely to be more of the same, but if you were a fan of episodes 1 & 2 then it is likely that this will rock your boat too. Awesome. Twenty bucks says there will be some sort've trogdor easter egg. I'll be buying it most likely. I'm in love with Telltale atm, b/t Strong bad for WiiWare and Sam & Max on the Wii. Good times. Cant wait, hope it comes to europe soon. We've always got the SB games after the US WiiWare / PC releases, but if we get this one on November 7th, does that mean we'll get 4 and 5 in December and January? I want this one now! Geez, how many of these are they gonna make? Where's Animales de los Muertos? or Lost WInds Vol. 2? @MrPoo: Those're probably going to be a while away. Thinking on a smaller timescale, I'm looking forward to Alien Crush (tonight, maybe? ), Art Style Cubello and Liight, although I wouldn't mind a bit of Mart Racer and Pop Up Pirate! I agree with you about Animales, but hey - (almost) all games with a long production time are pretty good in the end, right (Mario Galaxy, SSBBrawl, DISASTER)? Hopefully it's gonna be worth the wait. I think we will be getting strong bad tomorrow. if not our next wiiware date will be november, so, I think we'll be getting it tomorrow. The 1st time we get a strong bad game before the US! As I predicted! I'm still sticking by my prediction of SBE3 and the 3rd Art Style game, as Fleeman alluded to. Unsure if I'll get it though. Isn't that a bit extreme, JoshZTP? I'm against violence myself but Episode 2 didn't have any notable acts of violence that would raise an eyebrow. As for vulgar language, not at all. There's no swearing at all, again, in Episode 2. I hope it stays that way. Now, I should add that I was one who was skeptical about getting SB in the first place. But I ended up trying Episode 2 and I'm glad I did. It's not "bad" by any standards and there's nothing, thus far, that I would label as objectionable. But I don't watch the online cartoon so your opinions may be based on that. If so, Episode 2 isn't like how you're describing it at all (if you're labelling it as adult-content). You should try the game before you make such claims against it. And trust me, I used to think SOMEWHAT similar to what you're thinking about it now. Things may change in Episode 3 so we'll see.. I wish WWW would review the SB Games and notice objectionable factors including language, violence, etc. @LAA: I can confirm for you that you're not getting SB3. You're getting Tetris Party, The Incredible Maze and lookie here, Home Sweet Home, too! Wonder how that'll turn out! This held true...it looks like Number 4 wil be 5th December for Europe unless it comes out in America on the 17th and Jan 3rd 2009 unless Ep 5 is out on the 17th December. @ JoshZTP: Strong Bad doesn't have any vulgar language AT ALL. The only mildly offensive word you hear sometimes is "crap" and calling that vulgar is really stretching it. I used to think that too, until I actually went to watch the original series and it's really funny, and not vulgar at all. It manages to do a fantastic job of poking fun at the younger, cynical internet generation without being as crude as it looks. It's much more intelligent humor than it looks like on the surface. You should really watch the series online before bashing it so hard, it's way cleaner than, say South Park, if thats maybe what you were assuming it is like; apples and oranges. Awesome, I loved the flash animations, but I still haven't had the time or Wii points (not to mention Wii blocks) to buy them... but I'll have to do that soon. Trust me, you woundn't understand... I have personal tastes and only like classic cartoons... and anything stupid adult oriented cartoons are stupid and corrupt today's society!!! Reason why I strongly LOATHE StrongBad and its graphics!!! Ah! I get it, you're just joking around and being sarcastic. @Tony: That link just goes to the pre-search page on www.ESRB.org. The site works weird, and the URL doesn't change after you search. But episode 1 is rated T for "Crude Humor, Mild Cartoon Violence, Mild Suggestive Themes." episode 2 is rated E10 for "Crude Humor, Mild Cartoon Violence, Use of Alcohol." It seems a little weird to me that the second episode got an E10 after the first got a T.
@Starwolf_UK: I know that, but I can't remember what "mild suggestive themes" episode one had that episode two did not. Far as I can remember, the games were pretty much the same in content.